Everything Known or Unknown to u about POWER!! 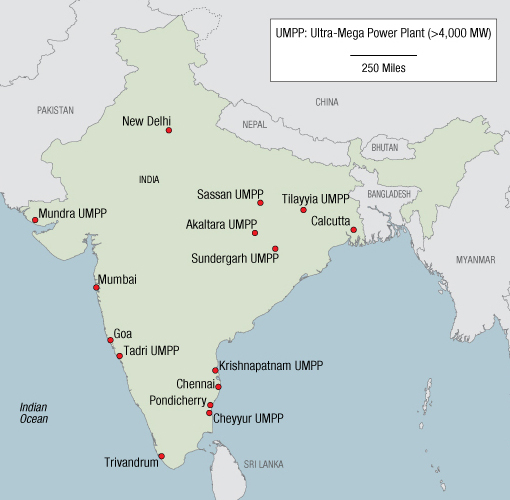 UMPPs(Ultra Mega Power Projects) – Tangled things!! As of now, PFC(Power Finance Corporation) being the nodal agency has awarded 4 UMPPs – Sasan UMPP in Madhya Pradesh( Reliance Power),Tilaiya UMPP in Jharkhand(R Power),Krishnapatnam UMPP in Andhra Pradesh and MUndra UMPP in Gujarat (TATA Power). Mundra and Krishnapatnam is based on Imported Coal from Indonesia whereas Sasan and Tilaiya have been allotted coal blocks.Tariffs were highly competitive striking an average figure of Rs 1.88/unit. In July 2012,TATA Power sought a tariff hike in lieu of change in coal prices as DISCOMs refused to revise the PPA terms.In its tariff petition of TATA,it has stated that hike in Indonesia coal prices will lead to rise in generation cost by Re 0.67- Re 0.70/Unit,thereby denting the cash flow statements of TATA Power.Inspite of this deadlock of tariff,TATA Power continue its operations of Mundra while R Power stalled work at the Krishnapatnam UMPP.R-Power held that the operations could start only after the revision of Standard Bidding Documents signed with DISCOMs.Delhi High Court has suspended the petition filed by R Power and thus they have plans to approach CERC. On the other hand,Sasan UMPP has made the steady progress. The first 660 MW unit is expected to commission by 2012-13.In Jan 2013,465 kV switchyard was commissioned in order to provided initial start up power.R Power has plans to commission the remaining units with a time interval of 3-4 months.As far as Coal production is concerned from Moher and Mpher Almohri,its much ahead of the targeted time frame. R Power is also struggling with legal hurdles w.r.t ambiguity of coal usage.Company was asked to stop production in the aforesaid coal blocks in lieu of R Power’s linking the Coal Scam by CAG. R Power’s third UMPP Tilaiya has faced many delays due to challenges in obtaining forest clearances and land acquisition. As of Nov 2013,Stage II forest clearance has been awarded thereby keeping the project in limbo. Progress on the bidding process of only 2 UMPPs (Sarguja-CHattisgarh and Bedabahal-Odisha) have stalled as the coal block areas have been classified as No- Go areas. by MoEF. Despite the elimination of problem of Go/No Go areas ,the bad omen of clearances still pending with Sarguja UMPP.Bedabahal UMPP re invited pre qualification bids as it has been awarded green signal as far as MoEF is concerned. Earlier, in Oct 2012 CERC had suggested revising UMPPs on BOO Model rather than DBFOT Model. Moreover,there was a proposal to supply 100% of the coal to the power plants fulfilling the shortage through coal import. Thus in the light of various issues,the development if UMPPs have been questioned by power plant developers.There is a need to build flexibility within the PPA structure to deal with uncertainties in a manner that is quantifiable for the prospective investors. This entry was posted in Coal, Latest Regulations, My Take on Power Sector and tagged Coal Sector, PFC, Reliance, Revival of Coal Sector, SASAN, TATA Power, Ultra Mega Power Plants, UMPP. Rural Electrification- a distant dream ! PAT(Perform, Achieve and Trade)- A Review! Competitive Bidding- “Not so Competitive”?